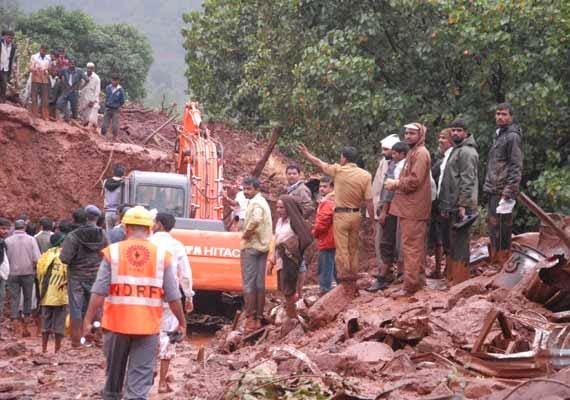 As the men and excavators of National Disaster Rapid force (NDRF) work tirelessly, to look for any survivors buried alive in the landslide disaster at Malin village, located on a hill slope of Western Ghat mountains, it is becoming increasingly clear that this mudslide, instead of being a natural disaster, is actually a man made one. It all started in 2007, when an inquiry report titled as “ Starvation, Malnutrition related deaths in 15 tribal districts of Maharashtra' was submitted by Mr. Lakshmidhar Mishra, former special rapporteur, National Human rights commission to the Government. To prevent starvation and malnutrition, while facilitating soil and water conservation, Government decided to launch a new scheme know as “Padkai” (Traditional system of community mutual aid) through Non Government Organizations. Under this scheme, hill slopes were leveled off and cultivable plots were created with partitions. In the Ambegaon Taluk of Pune Distrct, “Shashwat” took up this scheme, under which terracing on private lands in the upper reaches of the hilly area around “Dimbhe dam reservoir”was carried out. As a result, farm lands that produced millet, started producing paddy, resulting in a food availability to the families involved from 4-5 months to 8-10 months every year. The project also prevented silt sliding down the hill slopes and getting collected in the dam reservoir below. All terracing works were carried out through “Padkai” schemes and were monitored by village youths, trained for measurement work by Government staff. After the terracing work was done it was cross checked and certified by the Government staff. According to a report from the ministry of tribal development of the Government of Maharashtra, 53 major works worth 370 Million Rupees were undertaken under “Padkai” scheme in 2011-12 alone. In the “Malin” village now buried under mud, “Padkai” scheme was taken up in 2013. 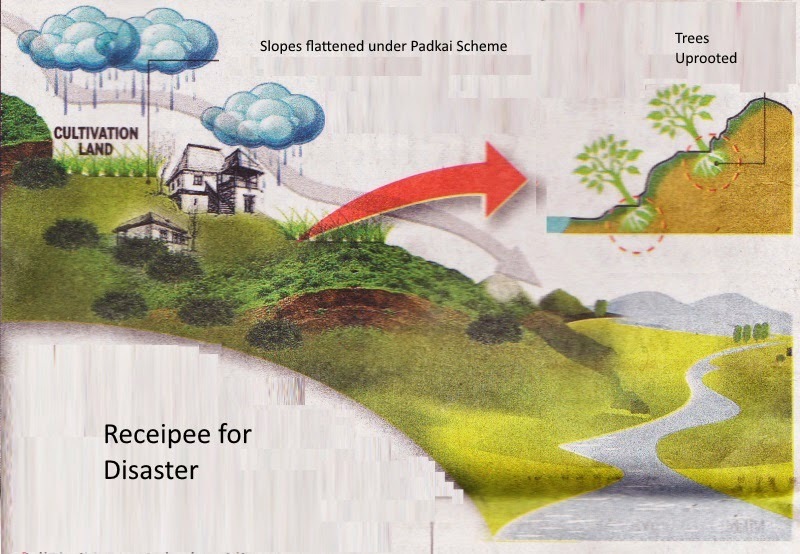 The “Padkai” scheme though lauded by experts needed to take some simple precautions to protect the soil through stone bunding and by making rills or channels to drain rain water. The soil on hill slopes is usually held togather by the roots of trees. Unfortunately, it appears that this simple fact was perhaps ignored and trees were uprooted to clear the land. This could have loosened the soil and might have made it prone to landslides. The experts now say that land under “Padkai” schemes was not surveyed adequately and plots were allotted on steep slopes. Proper bunding of the plots was not done, which might have led to heavy soil erosion. No nullahs or channels at suitable distances on the hill slopes were dug to drain away the overflowing rainwater to stem its effect on soil fertility. So it all boils down to usual carelessness of the Government officials in measuring and levelling the land, carelessly uprooting the trees and non provision of drain water channels. What is even worst is that all these works were carried out under a scheme to provide employment guarantee to the rural folks. 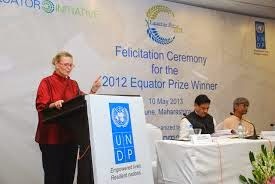 The 'Malin' disaster is a sad aftereffect of the thoughtless bungling of all environmental concerns, expressed by many. What has been done is a ready prescription for the disasters to happen. It is never wise to play with laws of nature. The punishment is always harsh and swift. It is unfortunate that the people of 'Malin' village had to pay for grave errors committed by someone else. We can only hope that the state Government shall realise the gravity of the situation, carry out immediate surveys and carry out rectification work as soon as possible to prevent such disasters at least in the future.